This entry was posted in Book Reviews, Christianity, Culture and Worldview, Holidays and tagged book review, David Suchet, foreshadowing, grand narrative, Jago, Jesus, Jesus Storybook Bible, Lloyd-Jones, theology. Bookmark the permalink. 🙂 Thank you for sharing this with us! May God bless you and your work in 2012! I think I will have to have this Bible Story Book for me and will share with my quickly growing up grandchildren. Thanks for sharing. Love it! Always good to know about more excellent theologically sound books. Thanks for sharing! My mom is going to get this for us for Christmas 🙂 do you have any thoughts about the creative license taken with thoughts, feelings, of the people? and the cartoony style drawings (unrealistic-shaped ark on point of mountain, etc)? 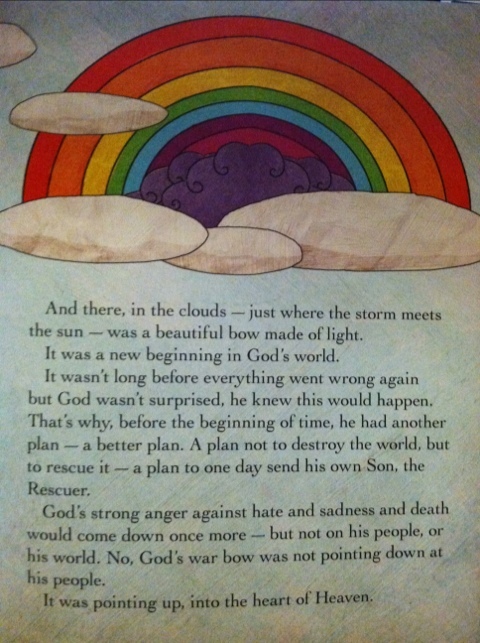 I love the “big picture” and really want that in children’s Bible stories! chapter book vs anthology – yes!